Chrysanthemum was originally a Latin word (the same in German & English) that emphasized the connection of the ancient Greek-Roman tradition to the Japanese. The chrysanthemum is known as one of the Four Noble Plants in the Chinese-Japanese tradition. Chrysanthemum is an international internet magazine that will appear twice a year, and will showcase previously unpublished Haiku/Senryû, Tanka, Haibun, Essays and Interviews in German and English. Haiku/Senryû submitted in English will be translated into German, if not already accompanied by a German translation, which is welcome but not required. 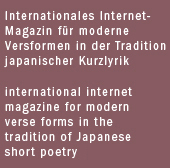 Tanka, Haibun, Essays and Interviews will appear only in their original language. Submissions in languages other than German or English are also welcome as long as as they are accompanied by a translation into German or English. Chrysanthemum welcomes work based both on traditional values as well as modern, innovative contributions in form and content, although there will be a special focus on innovative work of quality. Chrysanthemum hopes to achieve a connection between the heritage of the genre and the development and adaption in countries outside Japan.